Which 150-600mm Lens Should I Get? > Which 150-600mm Lens Should I Get? In 2013, Tamron introduced the 150-600mm f/5-6.3 Di VC USD, an affordable super telephoto zoom with a huge and versatile focal length range. The following year saw Sigma introducing a pair of similar lenses – the 150-600mm f/5-6.3 DG OS HSM Sports & Contemporary models. Now Tamron has released an update to their original lens, adding a "G2" tag to the name. Considering that neither Canon nor Nikon makes a native 150-600mm lens, it seems a bit odd to be spoiled for choice in this particular market segment. However, that's exactly what's happened. The third party manufacturers have solidly filled a niche that the big two lens manufacturers have yet to fill. With so many options available, you may be wondering which one is the right lens for you. Read on for our take on this interesting crop of lenses. The lens that started it all, the Tamron 150-600mm f/5-6.3 Di VC USD Lens, burst onto the scenes in 2013 and was immediately a popular choice for sports and wildlife photographers whose budgets did not extend to the Canon big white telephoto lens range. Its price-to-performance ratio makes it an excellent value. This lens is sharpest in the middle of its focal length range with less sharp results produced at its widest and longest extents. Unfortunately, this lens turns in its worst performance at 600mm, an important factor considering that most consumers purchasing a 150-600mm lens likely intend to utilize the longest focal length a significant percentage of the time. The Tamron 150-600 G1's vignetting performance is typically mild for lenses in its class, showing roughly 1-1.5 stops of corner shading when used on full frame cameras. Flare is fairly well controlled. You may notice mild pincushion distortion if straight lines are near the long edges of your frame. Important for a lens such is this is weather sealing, and indeed Tamron's initial 150-600mm offering has a level of weather sealing. Like three of the four lenses in this comparison, the Tamron 150-600 G1 features a 95mm front filter thread. Filters of this size are certainly not inexpensive, but... compatibility with filters makes for a more versatile lens. Some may find Tamron's zooming mechanism, which rotates in the opposite direction compared to Canon lenses (Nikon standard), a bit frustrating. Focusing is probably the weakest aspect of this lens. The Tamron 150-600 G1 we tested sometimes failed to lock on to a subject in good light even with a high contrast and accuracy consistency was not stellar. The good news is that Tamron eventually issued a firmware update to improve focus performance. We did not retest the lens, but initial reports suggested the AF performance was improved. The bad news is that, unlike its successor, this lens will require a trip to Tamron's service department to modify the firmware should an upgrade be necessary. One obvious advantage of this lens is its budget-friendly price. In a rather surprising move, Tamron released the 150-600mm f/5-6.3 Di VC USD G2 (Generation 2) Lens only 3 years after the introduction of its predecessor. Improvements included increased sharpness and contrast in the shorter and longer focal length ranges (with the middle focal length range remaining similar), an updated exterior design with metal construction, better AF and VC performance, a new zoom lock mechanism and compatibility with Tamron's new TAP-in console. Differences in vignetting, flare and distortion are largely insignificant between the G2 version and its predecessor, which is somewhat surprising considering they feature different optical formulas. Lateral Chromatic Aberration (LatCA) is moderately apparent in both of these lenses, though correcting the issue in post processing is typically quite easy. With the ability to update the lens' firmware and adjust focus parameters, the G2 version allows for more flexibility and peace of mind for its users. For those needing focal lengths beyond 600mm, the G2 has new dedicated 1.4x and 2x teleconverters available. 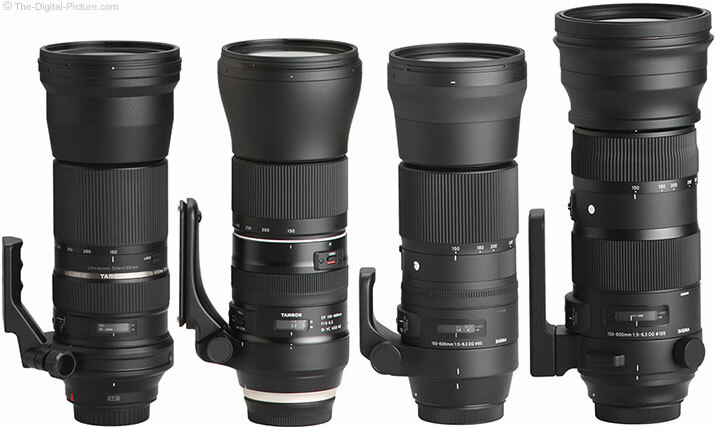 Sigma made a big splash in September 2014 when they announced two 150-600mm f/5-6.3 DG OS HSM Global Vision lenses at the same time, featuring a Contemporary model and a higher grade Sports model. From a sharpness perspective, the 150-600 Contemporary lens edges out its Sports counterpart until 600mm where the Sports version is slightly better. Full frame camera owners will experience roughly 2 stops of vignetting in the extreme corners with both lenses. However, the Sports lens' vignetting is more gradual and encroaches farther into the center of the frame compared to the Contemporary lens (which has sharper falloff around the edges). While both lenses turn in average performances when it comes to flare, the Contemporary version features more contrast when the sun is in the corner of the frame. Both lenses show very slight pincushion distortion over the entire focal length range. A benefit shared by both lenses is compatibility with Sigma's USB Dock, allowing for easy end-user firmware updates and access to customizable focus options. Below is a feature comparison chart followed by the available maximum apertures by focal length for the lenses discussed above. If you do not need weather sealing, it's difficult to top the value offered by the Sigma 150-600mm Contemporary lens. It's only slightly less expensive than the Tamron 150-600 G1 (the least expensive lens in this group) yet offers class-leading image quality and customizability via Sigma's USB Dock. If weather sealing and focus consistency are a priority, the Sigma 150-600 Sports and Tamron 150-600 G2 should be your top considerations, with the deciding factor likely being the price-to-image-quality performance ratio desired. And lastly, the lens that started it all – the Tamron 150-600 G1 – still remains a good choice if one's budget is the primary limiting factor.